Five years have passed since "ars vivendi" started. Where will "ars vivendi" head at from now to the next 10 years? The ars vivendi program has kept accumulating the basic information of what has happened in Japan. The program has let people in the world know about their research activities. This volume consists of achievements of various research activities and is also the restart volume after the Global COE Program is over. Introduction TATEIWA Shin'ya "Between Five Years and Ten Years"
2 UENO Chizuko "Sociology of Care: Toward the Welfare Society of the Sovereignty of the Involved Persons"
2 MATSUBARA Yoko "A Bibliographical Essay on Mr. Powderly's Interview"
3 HOTTA Yoshitaro "Development, Supply and Policy of Communication Equipments for People with Severe Disabilities"
1 FUKUDA Kazufumi "Innovation and Entrepreneurs' Role in the Video Game Industry: A Case of Digital Texts of Benesse Corpotration"
2 KATO Yukiko　"Can Art Be Involved in Ars Vivendi? 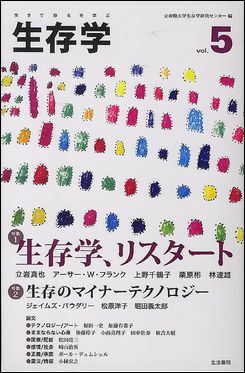 : Art Seen from Energetics"
1 GOTOH Reiko "'Family / World' of People with Schizophrenia"
2 KONISHI Mariko "Codependence and Pathology: Searching for Wives of Alcoholics"
3 TANAKA Moriyasu "Gregor and Women: Die Verwandlung as Literature of Care"
4 AKIYOSHI Daisuke "'Stuttering' Seen in Mr. TERAYAMA Shuji's Works"
MATSUDA Ryozo "Toward Debates on 'Rationing' of End-of-Life Care: Insights from A UK-Japan Comparison"
SAKIYAMA Haruo "Toward the Point of Mixture of the Society and Emotion: Through Dialogue with Ars Vivendi"
KOBAYASHI Muneyuki "Major Earthquakes and Extras: Transition of the First Report after Earthquakes Happen"
HORI Tomohisa "Reflection of the Second Korea Japan Disability Studies Forum"
HASEGAWA Yui "'Switch-Ken's' (Study Group on Switches) Visit to Korea"
YOSHIDA Sachie "Between Japan and Korea: Visit to Iksan / Sorokdo and Report of the Second Korea Japan Disability Studies Forum"
ONO Mayuko "Energetic Korea: Interview to a Lawyer who Brings Passion to Suits of CRPS"
WATANABE Katsunori "Oganizational Collaboration Between Japan and Korea over People with Disabilities"
ARIMA Hitoshi "Several Things I Learned during My Stay with Prof. Arthur W. Frank"
ONO Mayuko "Narrative about the Symposium whose Theme is 'Narrrative': Participation Report of the International Symposium　"Experiences of Illness and Narratives: Possibility of a Narrative Approach as an Analysis Method"
SHINOGI Ryo "Reread of the History of Psychology, Psychological Tests by Movies and Visualization: Investigative Reports about Public Library in Boston and Hugo Münsterberg"
KAWABATA Miki "I was in Berlin in the Summer 2011: Report of IALMH and Visit to the Deutsche Hygiene Museum and Belin's Public Bath"
HAKODA Tetsu "Opposition to Big Society and Foucault's Applied Reading: Report of the Conference at Cambridge"
NAKAKURA Tomonori "In Order to Create the Reality: Inviting Mr. Maurizio Lazzarato"
NIIYAMA Tomoki "Report of Social Investigation and Medical-related One in the Republic of Ghana"
ISOBE Atsuko "White Dot Design in the Green: Now and from Now on"